Arete Forks hut, photo taken in 1960 not long after construction. 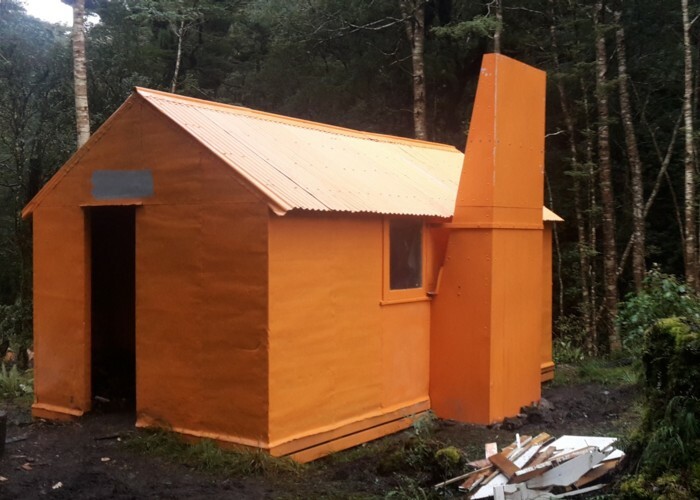 (6 bunks, wood-burner, firewood available) is a standard forestry hut in the Tararuas. The creek is 20m from the hut. The hut can be reached by dropping down the spur from the Waiohine Pinnacles and is a managable escape route for those not able to cross the pinnacles in bad weather. The route is cut through the bush section descending to the hut. The downside to Arete Forks is getting out. The sidle track down to Cow Creek Hut is maintained but as bad as sidle tracks come. Steep, crumbling, slippery, full of unnecessary ups and downs with a total climb / fall greater than would be necessary to reach the peaks above. The other options (recommended in the hut book over the sidle track) are to follow the creek (requires swimming the pools) or climb to the Table Ridge. The hut is managed by the exNZFS volunteer group. Arete Forks Hut • By TararuaHunter. Licence: cc by. Added 12 May 2009 by madpommadpom. 11 revisions, most recently 10 August 2014 by TararuaHunterTararuaHunter.